Where: Serafaery is based in Portland, Oregon. 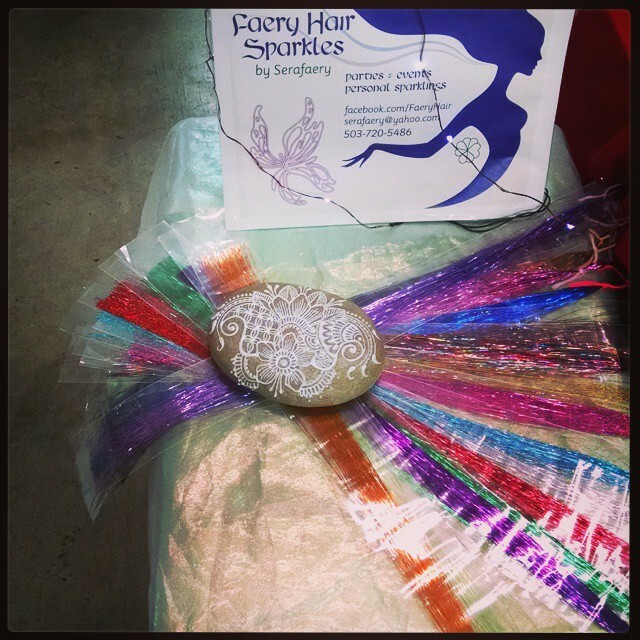 Faery hair is a service; the magic of adding sparkle to hair, with pure silk Faery Hair Sparkles. Rates: $3 per strand 5 strand minimum gently suggested (some could fall out right away, and we don't want you left with nothing). Most people get between 10-30 strands, we have done as many as 100 - the amount of sparkle is up to you! Party rates are usually hourly, text, call, or email for details: 503-720-5486 or serafaery@yahoo.com * house calls are currently limited, but if Sera cannot sparkle for your event, she can suggest others who may be able to, so please feel free to email about it. What: Faery Hair sparkles are the highest quality silk sparkles, added individually onto a single hair for a subtle, magical effect. No metal beads or glue. Faery Hair can be treated just like regular hair: wash, brush, dry, curl, flat iron, color, and process as usual. They can last from a day to several months, depending on the whims of the faeries. Average is 3-4 weeks. We use only silk Faery Hair Sparkles, which you can purchase online at www.faeryhairsparkles.com You can also purchase from Sera in person anytime in Portland. True Faery Hair is long lasting, durable, and beautiful. It can be washed, brushed, blow-dried, flat-ironed, curled, hennaed, and colored over safely. No metal, these can go through MRI scans safely. Not tinsel, polyester, or nylon. Treat it just like your hair, no special maintenance needed. Synthetic or polyester silk strands from Amazon and other sources are not the same; we have tested all of them, and insist on only using the best silk Faery Hair Sparkles. You can be as sparkly or as subtle as you like. Many colors. Images and videos on the pictures page. Why? It is our mission to sparkle the world. Sparkles make everything better. Faery hair brings delight, in a small, gentle way. We feel that the world needs more sparkles and delight, at this time. Faery? Really? Dont make me laugh. Nice sales pitch about "knock offs". Its a strand of polyester. How can It be different? These are made of silk. Other brands are bulkier and knot up differently, and can’t handle things like styling and heat as well as these can. I don’t know what you have against these people, but I’ve met them and they’re some of the sweetest people in the world, and they definitely don’t deserve your bitter negativity and rude comments. Went today!!! Love! Love! Love my sparkles! Even talked my sister into a few! Recommend! My sister took me and my daughter to her today. They got the faery hair and my little 5 yr old loves it! It also looks fantastic in my sister's hair. Sera worked great with my daughter in being patient, guiding her thru the process and making her feel like a little fairy. Thank you Sera!